Protections are particularly needed in the public sector where citizen interests are scattered but the values of controlled assets can be enormous. This fundamental principle of commerce is routinely ignored in the business of government; especially right here, right now. For years, the BC Liberals have been financed by what the Sun’s Gordon Hoekstra, in Corporations fill Liberal coffers, called “a well-heeled corporate coterie.” Among the lead supporters is gas company Encana, which, with Teck Resources, added $2.5 million to Liberal accounts. These and other companies made large contributions for reasons of self interest. Indeed, they got results. 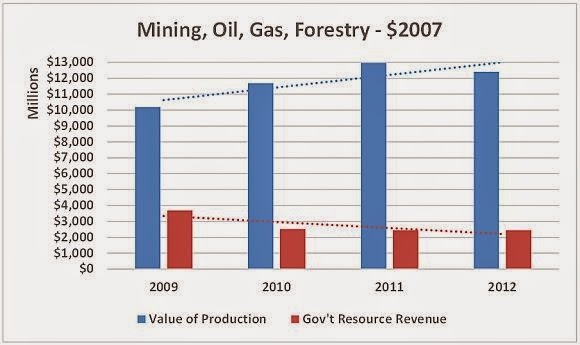 In 2005, BC’s revenue from natural resources was 18.5% of the value produced. In 2012, the revenue share was 11.4%. Had the percentage of 2005 been applied to the most recent fiscal year, the province would have recorded additional resource revenues of $1.2 billion. A billion here, a billion there, and pretty soon you’re talking about real money. Since when does political donations become corporate welfare and not be called corruption. ?Tell that to the people lined up at the food bank in BC where natural gas has an apparent negative return on royalties after credits are factored in,big picture,and water is bottled royalty free in BC. First, clearly there is no need to wait more than thirty years, until 2046, for it to start raining down Sparkle Ponies (i.e. our very own golden unicorns that were right here, for real, have been taken from us since the Golden Era got rolling as your resource revenue graph above, and your MSP revenue graph from yesterday, clearly demonstrate). Second, this would all be well and good if, indeed, it was growing our economy. But clearly it is not, as the last reports of the (not business unfriendly) Progress Board also clearly demonstrated. What happened to/who closed down that Progress Board again?